ilg in the Pain Cave nearing 11,000′ enroute to a podium at my self-created and now popular; Agassiz Uphill in Kinlani, AZ. 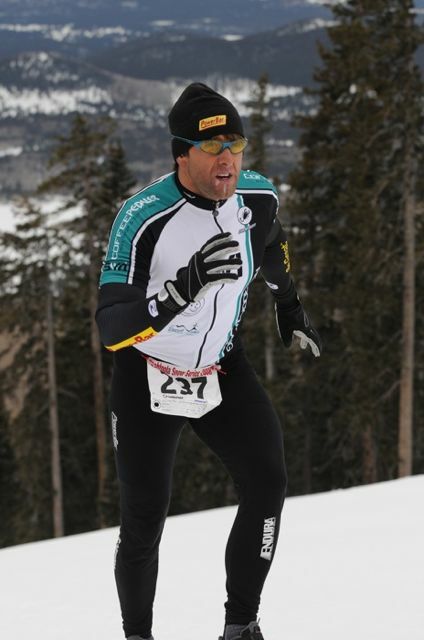 take Sacred Pilgrimage to my Winter Warrior 10k Snowshoe Race (now a National Qualifier) in Durango at the Durango Nordic Center this February 9th, Saturday. registration at 9 am, races begin at 10. 5k, 10k National Qualifier, and kidz snowdash! 500′ of vert per 5k lap. pristine terrain. crazy amazing raffle prizes from local businesses! family event, all ages/abilities welcomed! It is great how ‘suffering’ can lead to happiness. Today’s suffer-fest of 26.5 mile bike followed by a 5 mile run led to a great high once completed! Sweat brings happiness, so get out and sweat!